Earlier this week, the King County Sheriff's Office used one of its helicopters to rescue a boy that was injured in a fall. It's the third rescue this summer. First responders are warning people to avoid cliff jumping at a popular swimming spot, after several technical rescues. In the summer, people flock to the Green River in south King County to relax and cool off. Some also jump from the many cliffs along the river gorge, which vary in height. “I’ve been doing it since high school,” said Justice Kramer of Federal Way. 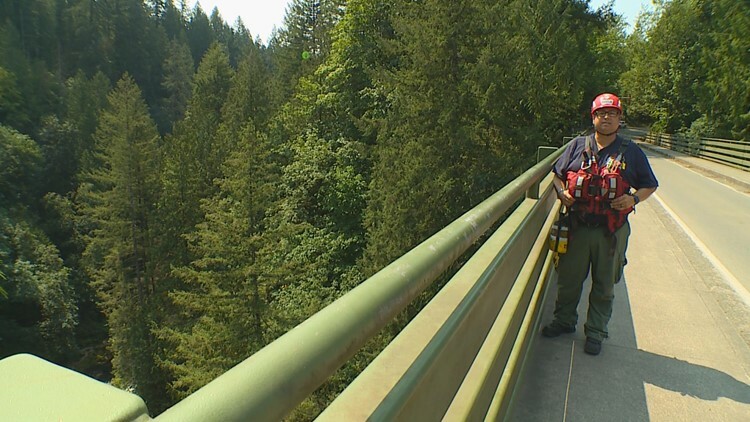 Earlier this week, the King County Sheriff’s Office used one of its helicopters to rescue a boy that was injured in a fall there. It’s the third rescue this summer. “This area is one where we have rescues on a regular basis,” said Tim Perciful, public information officer for Mountain View Fire and Rescue. Perciful said he encourages people to enjoy the beautiful area but would prefer they not jump from the cliffs. “People just aren’t thinking, and it’s a big concern for us,” he said. He added that during the rescue this week, people continued to jump around first responders. He said while many jumpers are fine, a slim margin of error is the difference between swimming away and serious injury. “You’re trying to get the area that’s deep enough so you don’t get hurt, and what happens if you don’t hit that area,” said Perciful. Tim Perciful of Mountain View Fire and Rescue. It’s why they’re reminding people to put safety first. “You know, I know what its like to break a leg, so I don’t jump anymore,” said Jason Mark, there supervising his son. He noted he snorkels in the landing zone first to check for hazards. Perciful noted the rescues are often technical, with water and rock shelves complicating the situation. He asked people to imagine that before diving in. “They could break bones, break their hip, their spine. They could be paralyzed for the rest of their life,” he said.